A Dubai-based worker from Hyderabad allegedly murdered his wife, dumped her body and fled to the United Arab Emirates (UAE) in the early hours of Sunday. The body was found on Monday near the railway track at Dabeerpura and the police immediately issued a Look Out Circular (LOC) against the culprit. 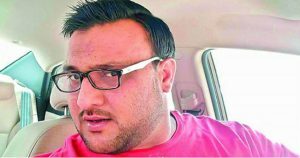 The accused, Akbar Ali Khan alias Hyder Khan, from Farhat Nagar in Dabeerpura married Zeba Naaz of King Koti 10 years back and the couple has three sons. According to the police, Hyder went to Dubai to work as a laborer and he returned to the city four days ago. However, the couple left the house on Saturday and were unreachable by the family. Locals alerted the police at 12.30 am on Monday about a sack with blood stains dumped between the railway tracks and a Nala in Dabeerpura. The police stated that the sack had Zeba’s half-naked body and that the accused throttled Zeba and then bludgeoned her using a blunt object. During the preliminary probe, police found out that Hyder went to the RGI Airport alone and boarded a flight to the UAE around 3 am on Sunday. Police are trying to get Hyder back to India through the embassy.